The claim to fame for vitamin D is the extraordinary health benefits it offers. Believe it or not, there is more to vitamin D than just bone health. Vitamin D behaves like a hormone. The advantages vary as the research is accumulated. Only recently have the medical community started realizing the variety of benefits provided by this vitamin. As they continue to study it, more and more benefits are emerging. Vitamin D promotes huge health and wellness perks with little cost. We all know that vitamin D is vital to our bone health but recent studies have shown that it also reduces our chances of diabetes. In addition, it plays a vital role in cancer treatment and prevention. Vitamin D also helps regulate blood pressure and reduces the chances of heart attack and stroke. Furthermore, regular vitamin D supplements help lower the risk of multiple sclerosis. All of the incredible benefits of Vitamin D are still emerging so stay tuned. The largest single source of vitamin D is, and always has been, sunlight. About twenty minutes of sunlight between 11am and 3pm a day will produce the recommended daily amount. The sun must be at 50 degree angle in order to get the healthy ultraviolet B rays that are necessary for your skin to produce your very own vitamin D. Your body needs 30,000 to 40,000 IU of vitamin D, however you cannot take that much in supplement because you will have a negative health reaction. Other natural sources of vitamin D include certain fish, like salmon and tuna. There are also the obvious places to find vitamin D, like milk. You can also take over the counter supplements do not go over 5000 IU of D3 per day. They are pretty affordable and easy to find. During late fall and winter you may need certain sunbeds that are equipped with a high Ultraviolet B lamp. Call my office 870-932-5661 and we can direct you. The studies on Vitamin D are relatively new in the medical community. We do know that it essential to our overall health and wellness. Vitamin D deficiencies have been linked to a number of ailments including certain infections, cardiovascular disease, and even cancer. Common symptoms include depression, obesity, and gut trouble. Even people with darker skin run a higher risk of being deficient in vitamin D. Vitamin D deficiencies affect over a million people world-wide. Waking up every two hours may be Vitamin D related. Any vitamin deficiency can be hazardous to our health. Vitamin D is essential to our well-being in more ways than one. Most of the time the sunlight we get on a regular basis is sufficient for our bodies to produce what we need so don’t break out the lawn chairs just yet. Be sure to exercise regularly and eat a balanced diet with a wide variety of vegetables. 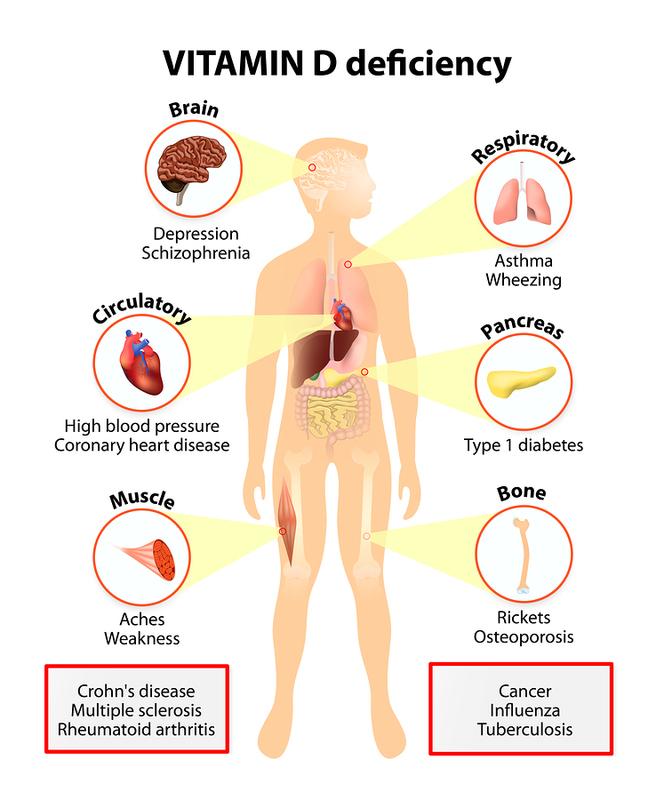 If you suspect you have a vitamin D deficiency you should consult with your doctor before adding a daily supplement. Go to www.vitamindwiki.com for the best web page on the HUGE array of diseases associated with deficiencies. My health changed dramatically when I started laying on the sunbed that had the high Ultraviolet B lamp. I sleep now 6 uninterrupted hours. Inexpensive health from God’s gift the sun. Why Do Therapists Tell You To Use It Or Lose It?